The why's and wheretofores of the upcoming changes at the SDWC. If you haven't noticed by now, after 2 and 1/2 years, I'm in the preparatory stages for moving the South Dakota War College to a new home at dakotawarcollege.com. *sniff* Blogger platform, I hardly knew ye. The cool thing is that I've been able to move most all my posts. And the comments are even coming over. Right now it's a matter of tweaking things to get them to work right. I've never been a CSS stylesheet person, but I'm muddling through. Why the move after all of my success here? There are practical reasons. I bought the dakotawarcollege.com name a year ago, and I'm glad I did. sdwarcollege.com has been snatched by a squatter in the interim. Renewal was due, and it got me looking at several factors for the continued life of this website. I'm also starting to get the RSS feeds added, so don't forget to update those, either. If you want to see what I'm working on as things have been fairly silent tonight, go check out my work in progress here. I've been thinking this website has been pretty drab for a while, so a housecleaning is in order. If you notice some goofy formatting, or other problems, please bear with me. They'll be fixed in short order. In the meantime, enjoy the summer day. Heidepriem said it was a thrill to serve with some of the people here today, the new Senators, and gave credit to the great Democrats who made this possible ("we can't thank you enough"). Heidepriem said he was confident Democrats can take control of the State Senate. Heidepriem talked about his father, also a World War II vet, a Republican but also a progressive and environmentalist. "Why did I change parties," he asked? Because he wanted to be part of a party that was about hope, not "hate. "Read that incredible comment here. Can you imagine the screaming and hollering if a Democratic governor or attorney general (if that ever happens again in this state) simply threw out a bunch of perfectly operative office equipment then scuffed up the place in the process? Given the lack of openness in our state government, I doubt we’ll ever get the full story about this mini-scandal. Read that here. Regardless, let me offer the counterpoint to Todd's opinion. The full story? Admittedly, I don't have a response on the walls being scuffed up, but that's a common negotiating issue when the State leaves a lease. And if inmates scuff up walls on the way out, they also have expert inmate crews who go in and fix that stuff. Senator and Former First Lady Hillary Clinton (D) continues to former U.S. Senator Fred Thompson (R) by five points and former Massachusetts Governor Mitt Romney by nine in early Election 2008 polling. The latest Rasmussen Reports national telephone survey shows Clinton leading Thompson 48% to 43%. The former First Lady has a 50% to 41% advantage over Romney. Hat tip to the monkeyballers over at SouthDakotaMac. There's a new Blog in town at http://www.badlandsblue.com. You should now see them in the feeds. A play about convicted murderer Leonard Peltier? Whether it is good, bad, or indifferent, I don’t see it playing in South Dakota any time soon. Maybe we should all see it, whatever our views on Peltier’s guilt or innocence, but man, this is going to reopen some major wounds in our state.Go read it here (with a youtube clip). Yuck. Why should we be surprised about this? "Murderabilia," or the fascination regarding the art and ramblings of convicted killers has been a sick underground trend for some time now. I'd just add this to the pile. To me, it's no more than wanting one of John Wayne Gacy's clown pictures. Somehow, I doubt the play is going to document what Peltier was convicted for. The killing of FBI agents Coler and Williams from fatal wounds to the head delivered by a high-powered rifle at contact range. Should this bother us? RC Council votes to give Cabela's a carrot. A really, really expensive carrot. Touting the future economic development benefits, the Rapid City Council approved agreements and incentives Monday that will bring outdoor outfitter Cabela's here. The incentive package includes $2 million in economic development funds and 30 acres of land where the Black Hills Visitor Information Center now sits. You are incorrect in your story, PP. "Nix on Six PAC" is not Stan Adelstein's PAC. Check your source again. Read that here as she falsely assumes I have no idea what I'm talking about. My response? Click on either of the images to enlarge, or you can go review my source - the actual filing - here. Sure. Don Frankenfeld's name might be on the PAC, but when I see that Stan was the sole donor - guess what - I think I'm pretty safe in my position that it might be considered Stan's PAC. If you haven't caught it yet, there was a new type of filing made with the Secretary of State's office recently. 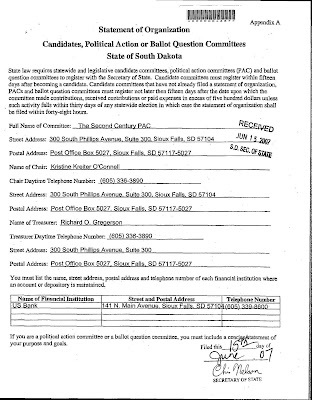 The brand spanking new Statement of Organization seems to have been filed first by the Second Century PAC which has a bit more information than the old one did. As we approach July 1, you should see a flurry of these types of forms being filed. Especially since there's a $50 a day fine for not getting them in. If you're involved in politics, you owe it to yourself and your campaign interests to intensely review the new campaign finance reporting guidelines. The Argus goes after State Government. Again. And the evil part of me hopes they succeed. I'm sitting at my computer recuperating this morning, wrapped in a blanket, after spending most of Father's Day miserably ill with the flu. That must be God punishing me for the tone of anonymous comments on this website. Anyway, as I'm looking back at what I missed yesterday, it looks like the biggest story from Sunday's news was the state's largest newspaper taking their monthly shot at State Government. Again. This time it's over trying to get a list of all state employees, and what they make. Which inevitably ends up being their take on how most of state government threw up roadblocks, etcetera and so on. More RC Mayor Stuff - On the net, and in the paper. 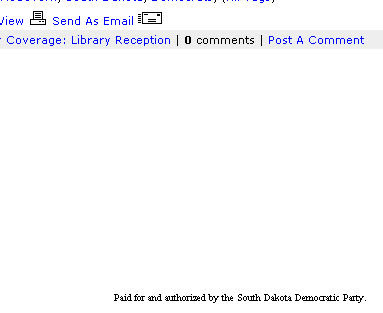 $9505 as funnelled through Focus South Dakota it seems as if Tom might feel a little obligated to follow the lead of the person who put him in his Senate seat. (For those of you who want to look at the financials for yourself, Page 6 on Tom's Report). So it's no big surprise that coming on the heels of Adelstein's continued personal and financial support of Alan Hanks, that Katus felt a figurative yank of the leash.